MLAG is good or bad in this topology diagram? 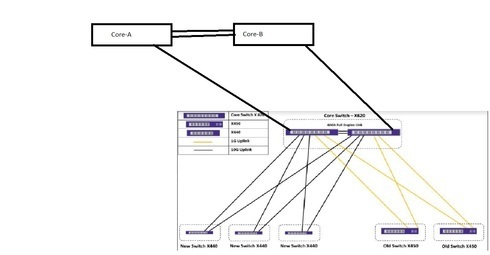 We have Core A and Core B Cisco switch's both are working in active-active and deployed in Building A, and in our environment, all access switch's are X440-G2 have edge license? Now I want to connect these core switches to Building B, so I now am creating MLAG over X440-G2 on Building B.
so May I ask is it a good way to designing??? yes, you can do MLAG with x440G2. I want to create X440-G2 Peers and all attached access switches will also X440-G2, Is X400-G2 is supporting for creating MLAG peer, and I don't want to create VRRP on MLAG peer I just want to transfer L2 traffic to Core Switches. If your old X450 switches are already working in MLAG created using X620 peers, then of course you can use X440-G2 in MLAG config as well. Note that X440-G2 is here a downstream device in MLAG desing; all you have to do is setting up a LACP/sharing on X440-G2 links to X620 MLAG peers. I've never used X620 as peers in MLAG configuration; as Micha said, X670-G2 would be the best fit. The diagram doesn't show any x440G2 in MLAG, but x620. They are interconnected via "40G links", which is not possible on x620. This diagram doesn't seem very accurate. Sorry. I didn't see the x620 (on mobile phone). You are right. Is this related to your other question VSS/MLAG? I never used X440-G2 as MLAG. In my opinion, the X440 is an acces Switch only and not a Distribution switch. However, woth an advanced edge license it should work. (See license requirements and x440 limitaions). We use a X670-G as MLAG peer and X440 as access. Perfect solution.